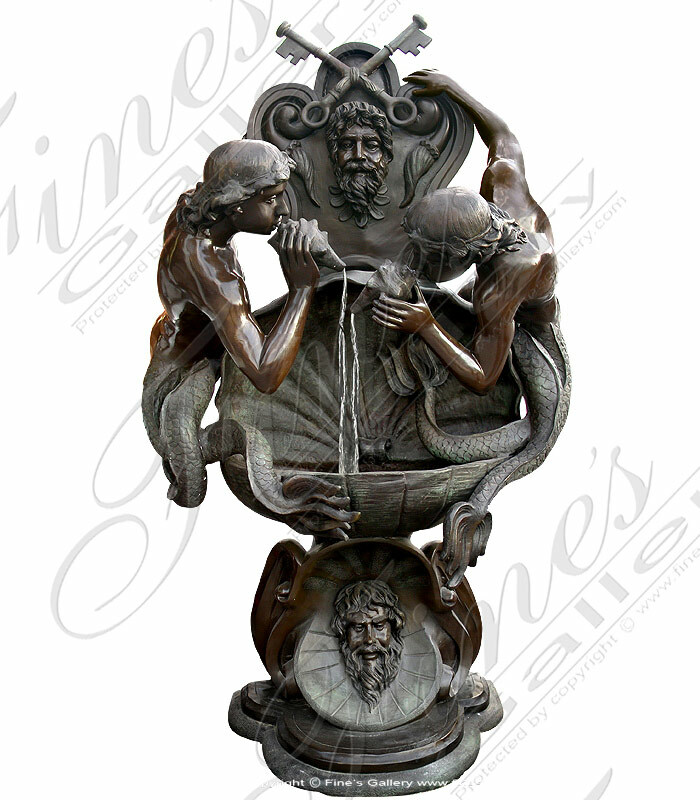 This wonderful bronze wall fountain will be perfect for your home or garden. 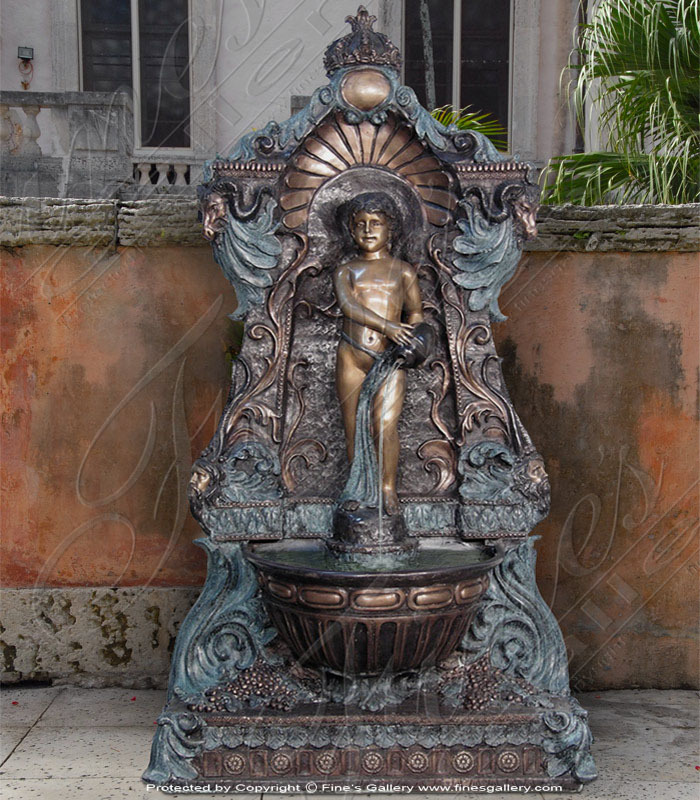 Featuring classic bronze with a mixture of other bronze coloring, highly detailed young boy, ornate pedestal and much more. Contact us today. This is a beautiful Bronze Wall Fountain. Artistically designed and cast in Classic Bronze. Highly detailed mystical half human half fish creatures decorate this elaborate wall fountain. Contact us today. 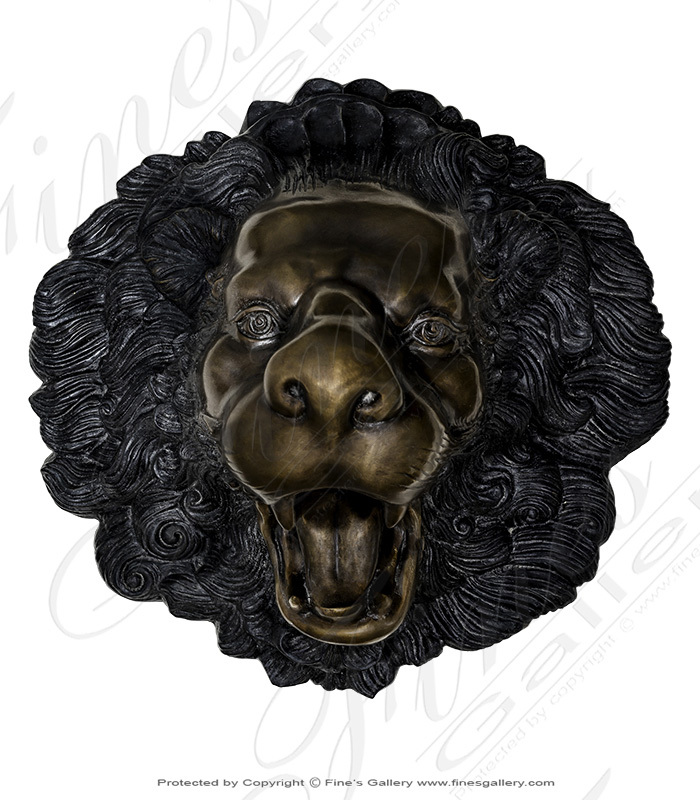 Cast in classic bronze, this lion head bronze wall fountain displays amajestic aura as the soothing spray of water brings serenity to the garden.Meticulous detail within thisartwork, displaying awesome realism. Call oremail the gallery today. 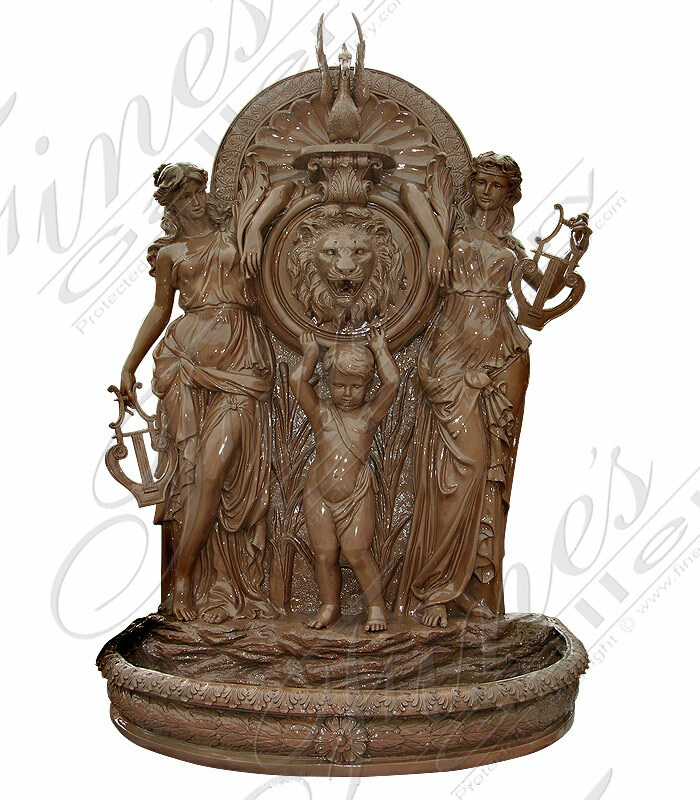 This is a one of a kind bronze wall fountain cast in malachite light green bronze.A very detailed designfeatures two maidens surrounding a young child beneath a lions headas itreleases water from a splendid fountain. Truly a majestic work of art! 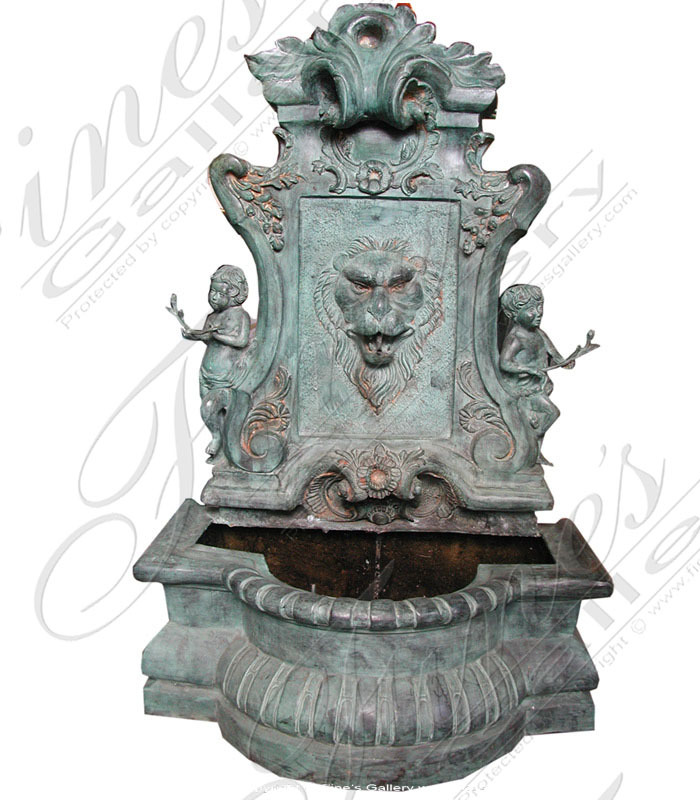 This gorgeous patina bronze wall fountain is certainly a timeless beauty. 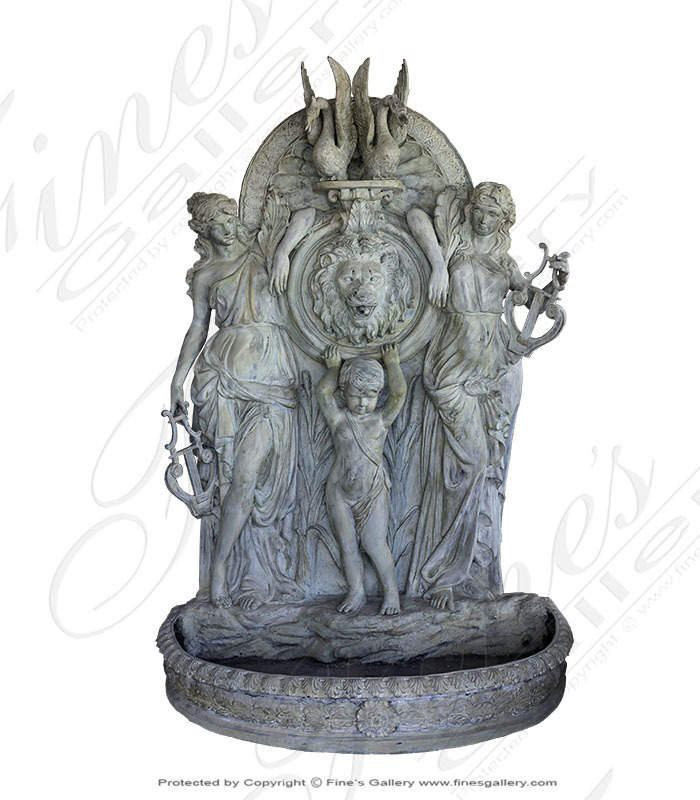 Highly decorated with symmetrical designs, children, and lions heads--this wall fountain is truly a one of a kind! Add this to your homedecor today. 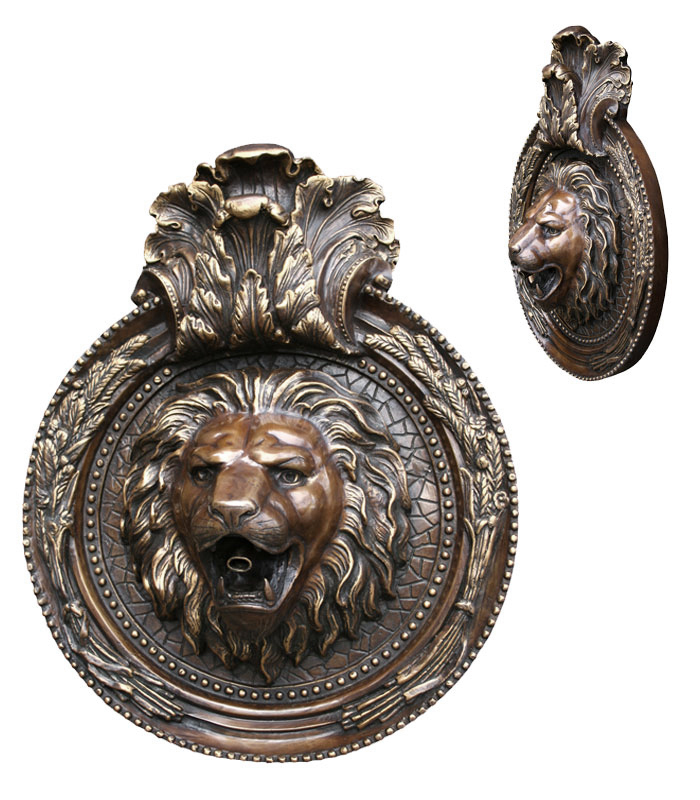 A symbol of distinction.The king of the jungle cast in a rich patina colored bronze, encircled by an ring of detailed ornamentation with highlights of gold. Contact the gallery for inquiries. 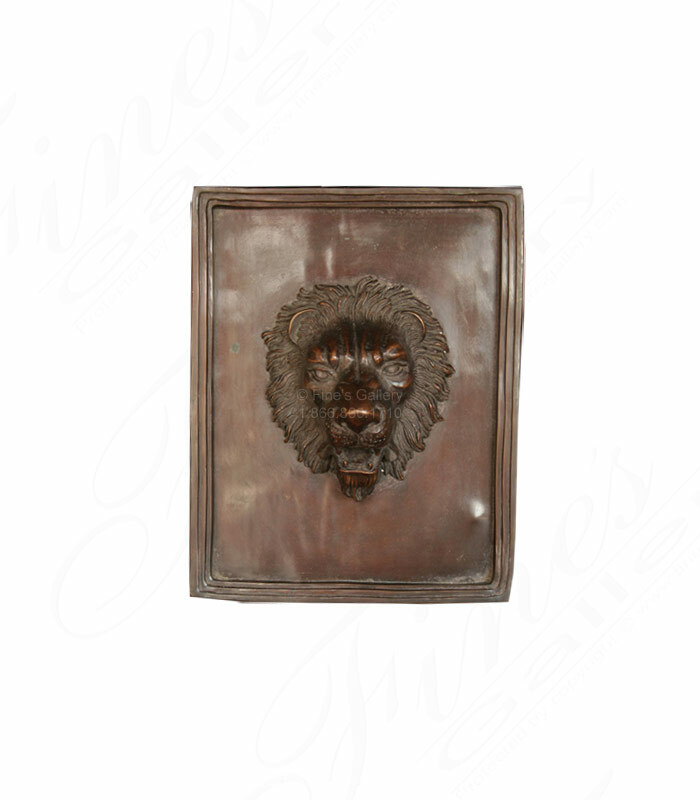 A magnificent lion head is carved into this bronze square, creating a beautiful wall fountain for your home. Finely hand carveddetails make this a spectacular display of beauty. 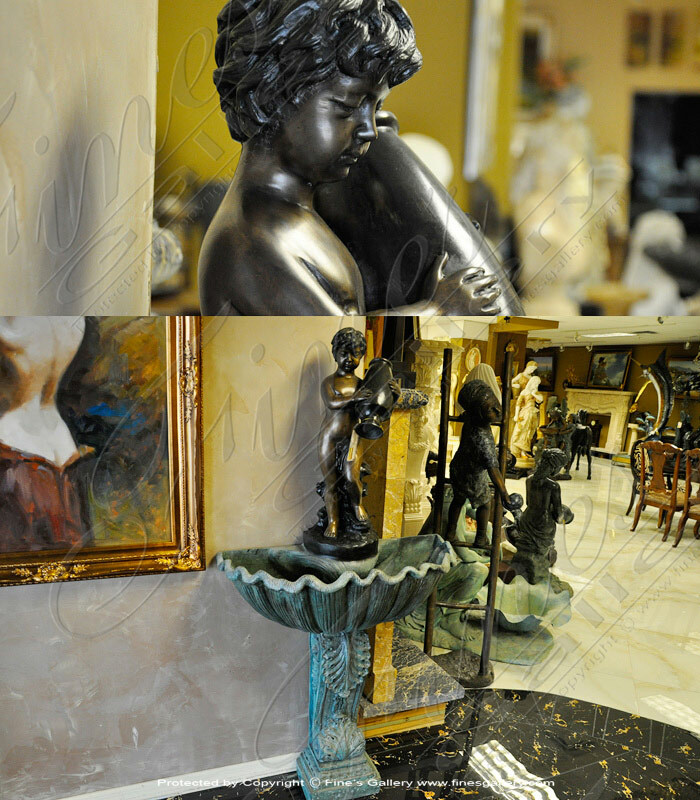 Let us helpenhance your home with luxurious bronze or marble art. 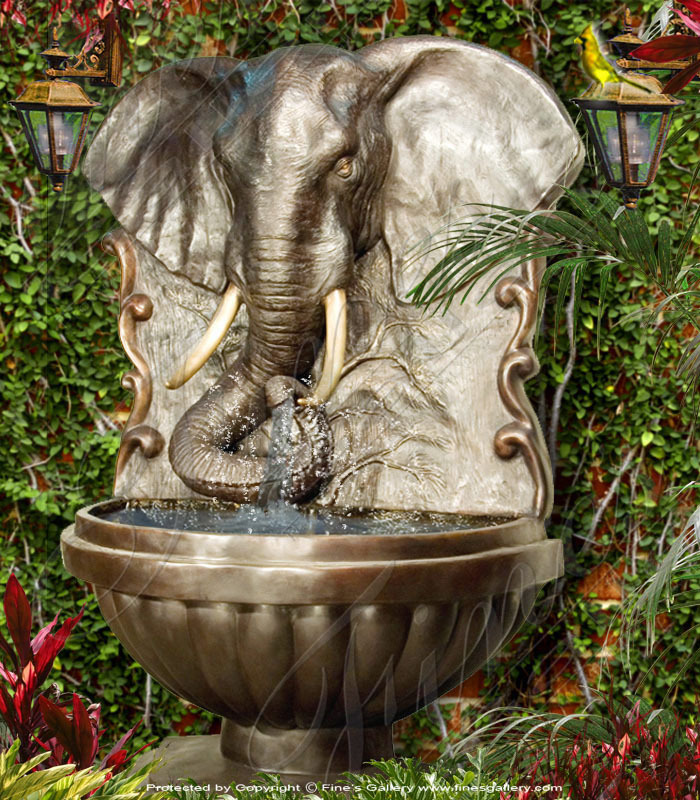 This gorgeous fountain features a finely detailed elephant head with water spraying from his truck into a shell-like basin. 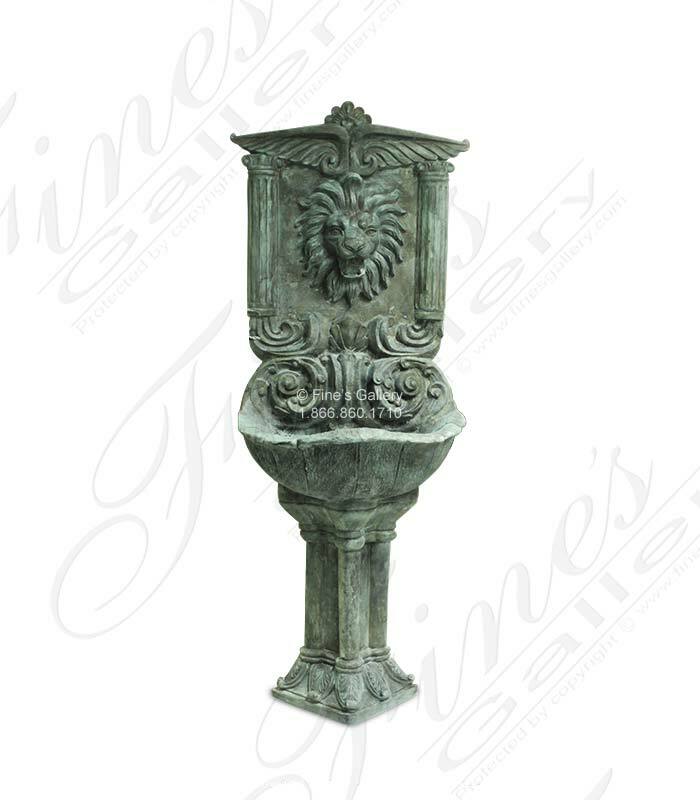 Perfect for a garden wall, this majestic bronze fountain will add luxury and elegance to any home. Call us today. 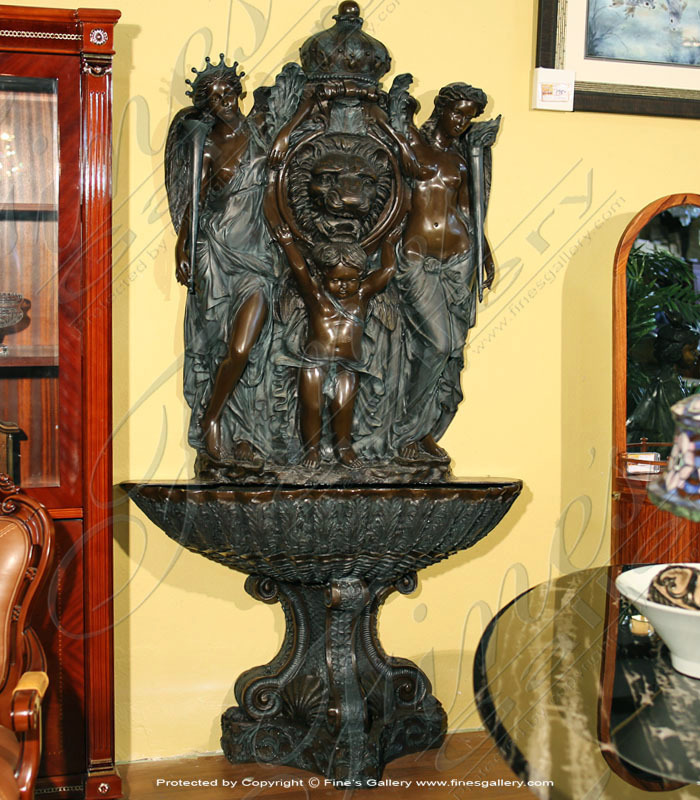 This ornate bronze fountain features a little boy pouring water from a vase into a large basin, and surrounded by an assortment of incredible nature themed detail in various bright colors. 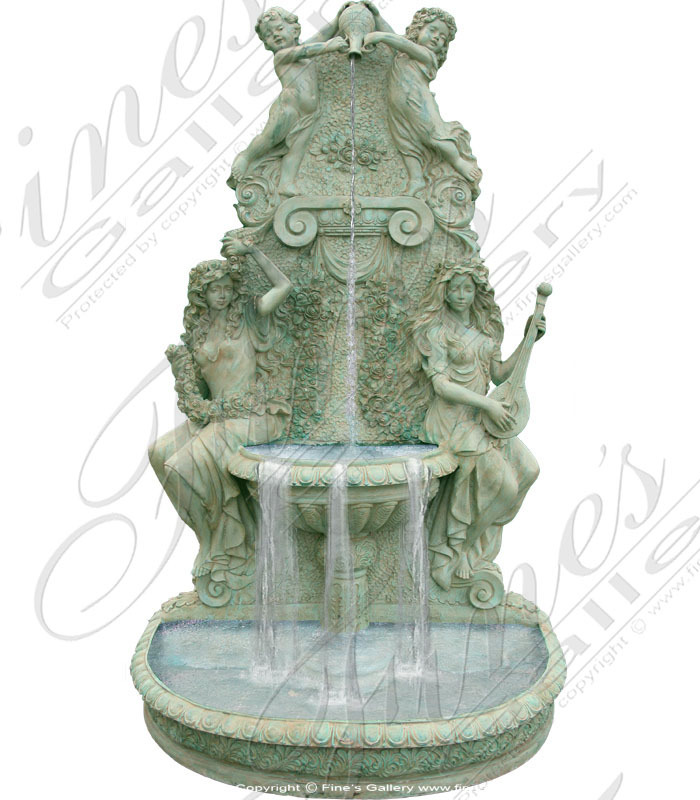 This fountain will add elegance to a patio, yard, or garden. 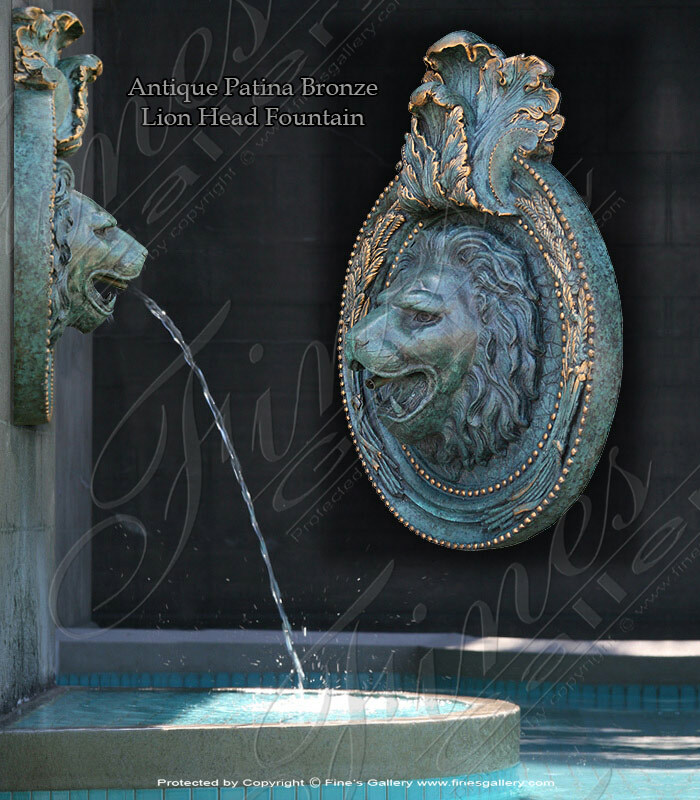 Majestic Lion Bronze Wall Fountain in patina bronze finish. 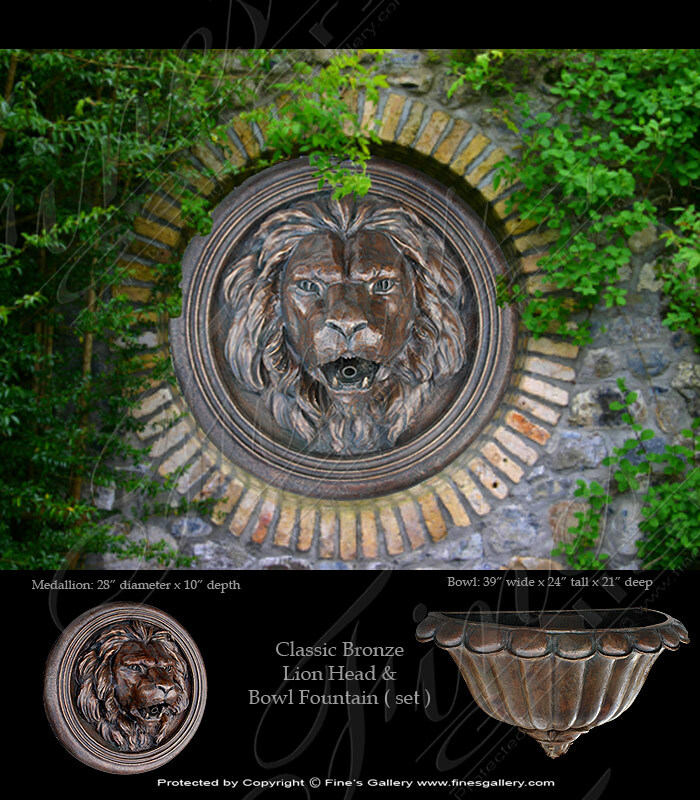 An antique style wall fountain feature perfect for indoor niche or outdoor garden. The patina green bronze will express quality and natural european look and feel to your estate. Two Grecian maidens take a break from their lyre music to stand beside a magnificent lion head fountain, while a lovely cherub plays beneath the waterfalls. This fountain is made from gorgeous bronze with a gold finish and creates a mood of enchantment.